Russia supports the proposed withdrawal of weapons of less than 100-millimeter caliber from the front line in eastern Ukraine, said Russian Foreign Minister Sergey Lavrov. "The possibility of withdrawing weapons of less than 100-millimeter caliber is under discussion now, and we are supporting it," Lavrov told a media conference during his visit to Slovakia on Saturday. "We will try to help the sides to reach an agreement, which would increase mutual confidence," he added. Kiev made a similar statement last week, saying arms not covered by the Minsk agreements, such as tanks and 80-millimeter mortars and other weapons of up to 100-millimeter caliber could be pulled back. The leaders of France, Germany, Russia and Ukraine brokered the latest Ukraine peace deal, dubbed the Minsk-2 agreement, in the Belarusian capital on February 12. It was agreed the sides in the conflict would pull heavy weapons back from the frontline and establish a security zone separating them. According to the document, the zone separating the warring parties must be at least 50 kilometers wide for artillery over 100-millimeter caliber, 70 kilometers for regular multiple rocket launchers and 100 kilometers for heavier long-range weapons. A final resolution of the Ukrainian crisis will be possible if the conflicting parties are kept to their commitments under the Minsk-2 deal, Lavrov believes. "It's important to keep telling them that, to make sure they comply with the agreements,” he said. International monitors have said the truce is generally holding, but there are still sporadic incidents of violence. The monitoring mission of the Organization for Security and Co-operation in Europe (OSCE) discovered military equipment belonging to both warring sides in an area near Shirokyno, according to the mission’s report on Friday. Shirokyno is near the front line, and under the Minsk-2 agreements weapons have to be pulled back from this area. 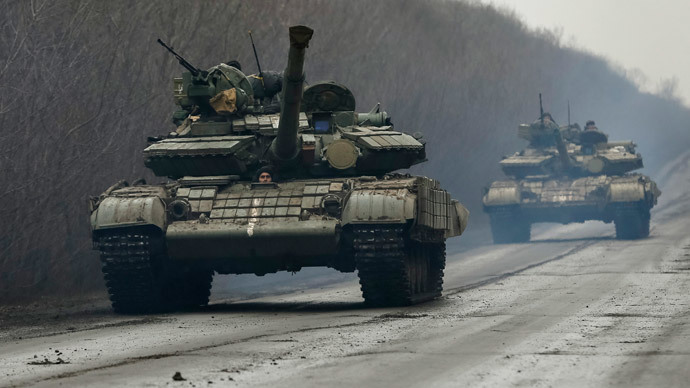 The OSCE Special Monitoring Mission (SMM) “observed one Ukrainian Armed Forces armored personnel carrier near Shirokyno that is under government control, and 15 DPR [Donetsk People’s Republic] main battle tanks in areas around Shirokyno under ‘DPR’ control. In addition, to the north of Zaichenko (DPR-controlled), the SMM observed two destroyed main battle tanks,” the report said. A Ukrainian military spokesman Andrey Lysenko told reporters on Saturday that three Kiev military men were killed and two more wounded in eastern Ukraine when a bomb exploded near Avdeevka. The self-proclaimed Donetsk People’s Republic spokesman, Eduard Basurin, told Interfax on Saturday that the Ukrainian military has violated the ceasefire many times in the past 24 hours, mainly in the Donetsk airport area. He said that from the 27 violations, 12 were monitored at the airport. The Ukrainian military used cannon artillery, tank weapons, 82-millimeter and 120-millimeter caliber mortars, he added. During his visit to Slovakia on Saturday, Lavrov once again expressed hope that the law, recently passed by Kiev granting the self-proclaimed Republics of Donetsk and Lugansk special self-rule status, will receive a proper response from the international community. On March 17, the Verkhovna Rada (Ukrainian parliament), passed a law granting the self-proclaimed Republics of Donetsk and Lugansk special self-rule status. However, it has postponed the introduction of the new status until the regions hold new elections under Ukrainian laws. Ukrainian MPs said the two republics will be recognized as ‘temporary occupied territories’ and voted this status should remain until the Ukrainian military fully restores control. The leaders of the Donetsk and Lugansk Republics have slammed the decisions as “shameful” and blamed Kiev for not having negotiated the law with them. The law “contravenes the Minsk agreements,” Lavrov said on Saturday. Moscow hopes “this will not provoke the undermining of these important accords,” he added.